The Assault Tank T14 is a premium Rank II American heavy tank with a battle rating of 4.3. It was introduced in Update 1.67 "Assault". 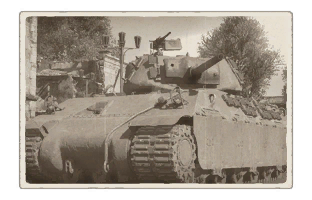 The T14 looks like a really sloped Sherman, but can be seen as a weird amalgamation of a M4 Sherman's playstyle, a M4A3E2's armour, and a M10 GMC's slopes. Its front armour is sloped heavily at 61° for ricochet effect and ~90 mm effective armour. Side top armour is also sloped at 30°, and with its armour thickness the same as the front it makes it easier to angle without worry of exposing weak points. Lower side armour is not sloped, but is even thicker than the top side and the front to provide some protection against glancing shots. Turret armour is also boosted, with ~130 mm at the gun mantlet and 101.6 mm all-around the turret, with the exception of the turret front with 76.2 mm as a weakpoint. Still, with a M2 HB machine gun, a 75 mm M3 gun, and a coaxial; the T14 plays similar to all American vehicles at this rank. With access to APCR ammunition, it can provide the punch of a M4A2 and M4A3E2 against its contemporary BR 4.3 enemies. Speed of the T14 is akin to that of the heavier M4A3E2, though would have a lower power ratio as it is heavier than the Jumbo by 5 tons. Outside of these specific features, it is also green. However, its green shade is not like the regular American's olive-drab colours. Its shade of green looks like that from the Soviet's T-34 tanks or even the premium M46 "Tiger" tank. Suspension wheels are 15 mm thick, bogies are 10 mm thick, while tracks are 20 mm thick. Tracks are peppered on the sides that give 20 mm extra where they are. Though the T14 is distinguished as a heavy tank, the armour stats do not give the most favorable impressions compared to the anti-tank weapons available in the 4.3 battle rating range. While the armour is relatively thin for a heavy tank, it is compensated with a heavy slope effect. The best armour are in the turret, and this information should be used to maintain a battlefield advantage. When facing a T14 from the front, aiming straight at the hull could produce results. Aim for the bottom of the T14's lower glacis, it will damage the transmission, immobilizing it, and will allow for flanking manoeuvres to get on its sides. If the tank is smart and has angled, blind it with smoke. Fire the smoke shells at or in front of them, then start moving. Because of the nature of this tank, they might advance through the smoke, unknowingly causing their own doom as it should be able to be penetrated at point blank! This is an assault tank, a brawler! Its 75 mm gun has a quick reload and the armour is good enough to bounce most shots. With its stabilizer, it also allows for fire-on-the-movie and perform short stops around corners to blast the enemy. The APHE shells decimate Panzer III's and Panzer IV's, but if not angled the Panzer IV will go straight through the upper glacis plate and do the same to the T14. The T14 is a boxy tank, so sidescraping is a valid tactics around corners. Ensure that the T14 maintains a 45 degree angle towards the enemy/target. Example: if advancing down the street in places like Advance to the Rhine, it's best to drive across the road in a 45 degree angle to bounce shots. Go slowly enough and the stabilizer can be utilized to return fire while on the move, forcing the enemy to withdraw from it's position. Try not to expose the side armour in any case as it may lead to giving the enemy an opportunity to penetrate the armour. On a further note, the T14s 75 mm can use up its ammo rather quickly, so be wary of the ammo count and be prepared to go back to the cap zones to rearm. This tank is slow off the mark, but once moving it is quite quick. The turn rate is slow at low speeds, so try and build up speed before turning. This is worth remembering when sidescraping. 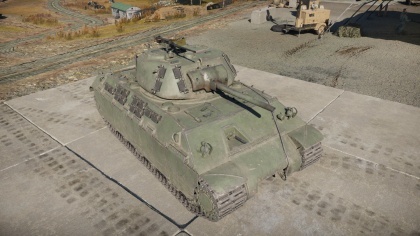 Because the T14 has APHE and APCR, it can punch through most opposing armour, including the drivers view port on the KV-1. With APHE, if aiming at Russian tanks like the T-34, aim at the turret cheeks and it will go through, or the drivers hatch or machine gun port for some lovely ammo cook offs. For the Germans, aim at lower glacis or the MG gunners position and it will hopefully knock out all the crew. Good ol' tried 75 mm gun. Access to APCR ammunition for an extra punch. Front armour is heavily sloped. Side armour is rather thick. Not a commonly encountered tank. Players may hesitate while they work out where to shoot. Base armour is only 50-70 mm thick. 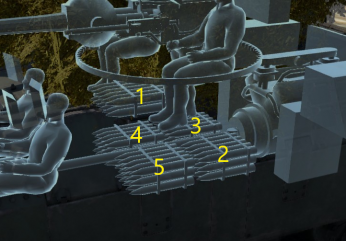 Hull machine gun port is a prominent weak spot. 75mm gun may have trouble dealing with heavily armoured enemies, even with APCR. In early 1942, a conference between United States Tank Committee and Joint British Tank Mission had the British propose the need of an assault tank. The assault tank, a designation reserved by the British at the time that was distinctive from their cruiser and infantry tanks, was not taken up by the US. However, the US agreed to a prototype production plan in which a vehicle design would be produced by both nations, and a limited production would be established for the better of the two. On 30 March 1942, the final details were placed with Aberdeen instructed to start designing a vehicle and a wooden mock-up, and the British also working on their vehicle based off the Cromwell chassis, which would become the A.33 Excelsior. The British set the estimated production scale for the assault tank to be 8,500 units. In May 1942, the details were finalized and a designation was chosen for the vehicle, T14. In June, the design and wooden mock-up was established and the production order for two Assault Tank T14 went to the American Locomotive Company. The tanks were produced in July and August 1943 for each unit. These two tanks would only be different except in their hydraulic power traverse, in which one used a Westinghouse model and the other had an Oilgear model. Which of the two tanks had which traverse model is not known. The two T14 were sent off for testing, the first model sent to Fort Knox and the second was sent to Britain. The Fort Knox tests showed a variety of problems in the design such as fume seeping into the crew compartment, cramped conditions, suspension problems, inaccessible components, and the bow machine gun tendency of breaking the operator's arm. The T14 also had a tendency for the tracks to be thrown and the overall tank was not very mobile with an underpowered Ford GAZ engine propelling the 47 ton tank. Regardless, the T14 eventually fell out of favor for the same reason the Excelsior did. The British had their Churchill infantry tank become more favorable to their armoured doctrine as the assault tank they needed. Due to the lack of interest, the T14 program was cancelled. Today, only one T14 tank remained intact at the Bovington Tank Museum, stored away in their storage hall. The assault tank concept did not die with the failure of the two designs. The Churchill fitted this role well in the British armoured force as an infantry tank and the Americans eventually produced simpler version of it as the M4A3E2 Jumbo. Skins and camouflages for the T14 from live.warthunder.com. Jeeps_Guns_Tanks. "#33 The Sherman Of The Future: Advanced Sherman UpGrades That Almost Made It Into Production." The Sherman Tank Site. WordPress, 12 Dec. 2015. Web. 22 May 2017. Website. Moran, Nicholas "The Chieftain's Hatch: British Assault Tank" World of Tanks. N.p., 02 Aug. 2013. Web. 05 Nov 2017. Website. Moran, Nicholas "Design and History of the M4 Sherman Tank During World War II" C-SPAN. 22 Sept. 2017. Web. 05 Nov. 2017. Video. This page was last edited on 26 March 2019, at 06:27.